Southwestern has a personality. It's what makes us unique. And it's just one more thing you'll have in common with more than 10,000 successful SC grads across the globe. Below are a few of the many traditions that you'll find at SC. We hope you enjoy reading them. Better yet, hit the visit link and experience the traditions yourself! On September 8, 1927, a new college tradition "absolutely unique among all the colleges of the world" began. On that night, the first "Building of the Mound" ceremony was born. On the first Thursday of each school year, students gather to hear Dean Leroy Allen's original speech. Following the speech, they follow members of the Student Government Association through the campus, stopping at points of interest along the way until the gang reaches the Mound. Then, one by one, each student adds their rock that they decorated the night before to the growing pile in front of them. Why do we do it? Dean Allen says it best: "For many years Southwesterners have been known as 'The Moundbuilders.' But this was a mere figure of speech. Literally, they built no mounds. But now it is proposed that they actually do so in a solemn ceremony that will at once symbolize the traditional constructive tendencies of the College, and at the same time pledge the loyalty of faculty and students to Alma Mater." In 1998 and 1999, when Newsweek listed the 15 most bizarre mascots/nicknames among colleges and universities in the United States, the SC Moundbuilders were right up there among the Banana Slugs and the Fighting Missionaries. So, you could pick a standard education anywhere, or a unique experience at SC. 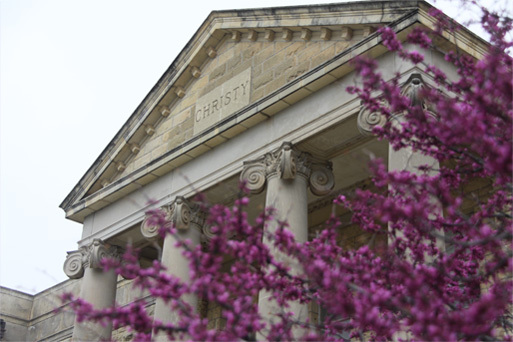 The 77 Steps leading to Christy Hall were added in 1910 after Richardson Hall was built. Students raised the money for the steps by singing throughout the community of Winfield. And they make an impressive sight when viewing them from College Street. The 77 steps were rebuilt in 2004. In recent years, students from the Class of 1998 made a startling discovery. The senior students on the team had decided to leave a rock etched with the words of the alma mater (college song - see lyrics below) by the mound. When they were working with the company doing the etching, they discovered that there are exactly 77 words in the alma mater. Coincidence? We may never know. A unique tradition among colleges is Southwestern's story of the "Jinx." When old Fairmount College (modern day Wichita State University) was defeated in a football game 41 to 3, a Southwestern student prepared a tombstone with the figure of a black cat at the top and the score underneath. From then on, Fairmount couldn't defeat Southwestern! The black cat came to be called the "Jinx." With the Jinx on their side, Southwestern continued to beat Fairmount for the next 14 consecutive years. In 1908, James R. Richardson of McPherson, Kansas, provided one-half of the money to erect the college's administration building on the summit of College Hill. For nearly forty-five years, Richardson Hall stood as a Cowley County landmark. On the night of April 15, 1950, Richardson burned. Its silver dome and the rotunda beneath it acted as a chimney. The fire spread quickly and by morning, all that remained were the exterior walls and the four pillars. The pillars have always stood for knowledge, hope, courage, and freedom - ideals that are reflected in all Southwestern activities. But in the days following the fire, the real pillars of the college were the emotional and financial support of the community and the Kansas West Conference of the Methodist Church, the loyalty of the students of today and yesterday, the devotion of Southwestern's faculty, and the Moundbuilder tradition of faith and achievement. With this kind of spirit behind him, President Alvin Murray vowed that a new administration building would rise within the walls of the old one but without a dome. The present building, dedicated in 1956, was named in honor of R.B. Christy of Scott City, Kansas, whose interest and generosity are recorded on the memorial tablet in the south wall of the porch. The inspiration for Builders Around the World came from Loy W. Henderson, distinguished member of the United States Department of State, ambassador, and diplomat for more than 50 years. A 1915 alumnus of Southwestern College, Dr. Henderson presented his ambassador's flag to the college on Founders Day 1964. Dr. C. Orville Strohl, then president of Southwestern, moved by the gift, created this area and the avenue of flags that accompany it to focus attention on SC's concern and interest in world affairs. The flags fly on all official college occasions such as the opening of school, Homecoming, Founder's Day, and Commencement. In the center of this area flies the American flag. On one side of the American flag is the Kansas flag with its motto, "To the stars through difficulties." On the other side is the official Southwestern flag with the motto "Let there be light." The national flags representing graduates flank this arrangement. Students from all over the world have graduated from SC. The flags in the present collection represent those students and their countries. Just as students come to Southwestern to receive an education, the college also sends students into all parts of the world. The natural beauty of the Southwestern campus is enhanced by Heritage Rock, a sculpture just north of the Welcome Center. For more than 25 years, Dr. Leonard Laws had been aware of the native limestone rock (approximately nine feet high) which had been dislodged during the building of Wallingford Hall and the Student Center. On the south face he could imagine a grazing buffalo, and on the north face he saw the bridge of a man's nose. Work on the rock was done during the 1989-1990 school term. As students watched, Dr. Laws chiseled out the buffalo and the profile of an Indian supported on its back. The carving makes it appear that the Indian is being supported, at least partially, by the buffalo-"and that is the way it was," Dr. Laws adds. On the west end of the rock an eagle is carved with its wings extended pouncing on a rabbit. "Indians were in awe of the eagle," Dr. Laws explains. "They aspired to fly as high as the eagle and to see far. Some Indians asked the eagle to carry their petition to the Great Sprit." "Heritage Rock is designed to call attention to the heritage of this part of Kansas," Dr. Laws adds. "The buffalo, eagle and Indian were here before the white man stepped on this prairie." The Southwestern family and visitors of the campus are reminded of this heritage and of their part in the legacy of the prairie by Heritage Rock. Grant Morgan Durbin was a 3 1⁄2 year old bundle of Teenage Mutant Ninja Turtle energy when he joined the Southwestern community in 1989. His mother, Nancy, was the athletic secretary and often brought Grant to Stewart Field House where he waited until time to go home. Grant died in 1990 in an accident, but the joy he brought to Stewart Field House is a living legacy for his parents, Nancy, father Randy and for his brother, Nathan. In 1998, as Stewart itself was renovated, the family made Grant's legacy of joy a permanent part of this old limestone barn. The stained glass window facing west is a reminder of a little boy who brought sunshine to so many lives just by being in this place with us. So, when you are in Stewart on a sunlit afternoon or evening, look up to the west and pause for just one moment to enjoy the light streaming through this beautiful window…a tribute to the little blonde boy who loved balls and cats and Teenage Mutant Ninja Turtles. There's a little angel in the window too. And, if you get close enough or look from just the right perspective, you'll see that the angel is wearing cowboy boots. Grant's light, Grant's spirit lives on. The window of glass and lead remember that for us. The black cat and the little boy...together again. Alvin the Alligator, the campus' unofficial mascot for four decades, became affiliated with Southwestern in 1960 when vacationing members of the Pi Epsilon Pi fraternity brought a pair of six-inch alligators back from a vacation trip. L.M. Neal and Joe Norton were original owners and kept the reptiles on the Neal farm north of Caldwell. It wasn't long, though, before Pi and Ep (names of the original pair) became part of the campus scene, traversing the campus and attending football games at the end of custom-made leather leashes and harnesses. An SC biology professor became the pair's unofficial keeper. When Pi ate Ep, the survivor was renamed "Alvin.” Alvin died at age 40 on January 11, 2000. Within hours of the discovery of the death, notes, posters, and an alligator-shaped floral tribute covered the glass windows of Alvin's home. The death and resulting autopsy revealed that Alvin had the last laugh on the spectators who had gawked at him throughout his life: Alvin was a female. So what to do with the mortal remains of the college's most memorable critter? A Derby taxidermist has returned the 10-foot corpse to a lifelike appearance. Alvin is currently on display back on campus and hunting for a final swamp to rest her toes.